Welcome to the award-winning campsite of La Pointe St. Gilles. 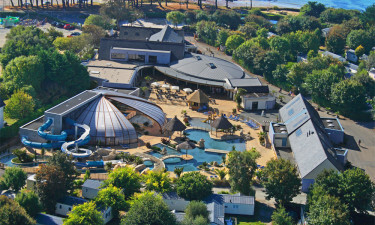 A family-run park with direct access to the beach and fantastic facilities, it’s no surprise that this luxury camping site holds the coveted La Clef Verte award. Why stay at La Pointe St. Gilles? The gigantic aquatic complex is undoubtedly the centrepiece of the campsite. The Lazy River has a retractable roof and boasts waterfalls, grottos and a slide zone. 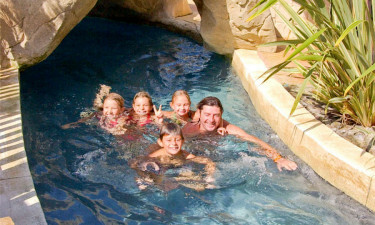 Kids have a choice of indoor pool with mushrooms and waterfalls or an outdoor pool with slide and water mushroom. There is also the lagoon and 2 family pools, one with water slides and a Jacuzzi, the other with retractable roof. For relaxation there are spacious poolside areas for lounging in the sun, or you may opt for one of the special well-being treatments in the spa centre. Tennis, football, basketball, volleyball and boules will keep you active on-site and for kids there is a wonderful playground with swings, slides and treetop adventure course. Bicycle hire for adults and children is also available. The nearest beach is La Pointe St Gilles Bénodet, just outside the campsite. Kitesurfing, windsurfing, sailing and kayaking are just some of the adrenaline pumping water sports on offer, with courses available in Bénodet. The more simple pleasures of sunbathing and swimming are of course permitted! The white sands of the Mer Blanche tidal lagoon are a natural marvel and an idyllic spot for a day at the beach. The historic town of Quimper is the cultural centre of Brittany. A short trip down the Odet River, the nicest way to get there is by boat from Bénodet. Explore the old quarter, cathedral, museums, shops, markets, restaurants and crêperies for a memorable day out. The town is also famous for its festival of Breton culture, the Festival de Cornouaille, held every July. Celebrated for its many art galleries, the lovely village of Pont-Aven also hosts a festival in August. With traditional dancing, music, parades and much eating and drinking, the Fête des Fleurs d’Ajoncs is a joyful celebration of Breton life. The magnificent walled town of Concarneau is one of France’s biggest fishing ports. Sample some of the best seafood at Au Crabe Tamboure or La Croisiere. The Le Safran restaurant serves delicious dishes and there is a bar for enjoying drinks at the pool or for a romantic evening under the stars. 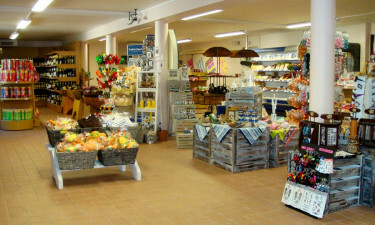 The on-site supermarket caters to all your luxury camping needs.